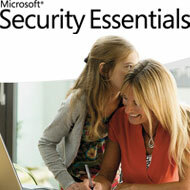 Security Essentials is an anti-virus package that has been released by Microsoft into a crowded security software market. The product is free but how does it stack up against the competition? The software can be downloaded from the Microsoft Security Essentials website. Versions are available for Windows XP and Vista/7 in both 32-bit and 64-bit installations. The Vista installer is under 5Mb whilst the XP installer is a little over 8Mb. The installed software uses just 11Mb of disk space. Microsoft have finally proved that it’s possible to create an anti-virus product which doesn’t take 3 days to download and fills your hard disk! Installation is quick and painless. Following a quick check to ensure Windows is genuine, the product installs in a minute or two. Security Essentials then proceeds to download the latest virus signatures and run a quick scan of your hard disk. The scan took around 12 minutes on a newly-installed XP system — it may not be the fastest, but full scans are rarely necessary. Microsoft have used a standard Windows interface which gets the job done. It may not be as pretty as competing products, but does an anti-virus package really need fancy graphics, theming options and other unnecessary widgets? Home: displays a summary of protection settings and allows you to start a full system scan. Update: allows you to manually download virus signature updates (updates are downloaded automatically so this should rarely be required). History: shows a list of detected items and those which you have quarantined or permitted. Settings: configuration options for scheduled scans, real-time protection, excluded files or processes, and actions. 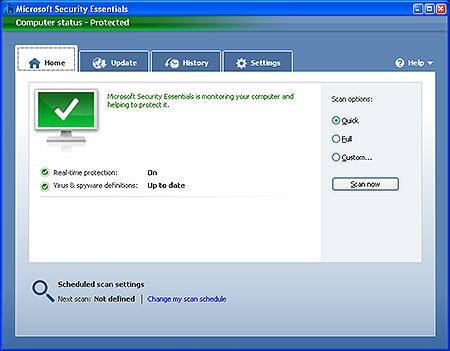 The product also adds a “Scan with Microsoft Security Essentials” option to the right-click menu, although real-time protection will be adequate for most users. Configuration is simple and the default options will be suitable for the majority of users. Even novices will understand most settings and never need to change them. Security Essentials compares favorably with the convoluted and confusing settings offered in some other products. Security Essentials detected all the viruses I threw at it. When a virus is encountered, a large system tray pop-up appears so you can remove the infected file, quarantine it, view further details, or allow it. You can also opt to send virus information to Microsoft (none of the data will be used to identify or contact you). I cannot guarantee Security Essentials will identify all known viruses or has a better detection rate than other products. However, the level of protection seems to be good and other testers have also been impressed by the results. Security Essentials uses around 80-100MB of RAM and 75% of CPU time during a full scan. During normal activity, the application uses less than 8MB of RAM and rarely registers any CPU activity. Other anti-virus software manufacturers should take note. Many commercial and free products are resource hogs that can make slower systems unusable. Microsoft’s solution has a barely noticeable effect. Microsoft Security Essentials is everything an anti-virus package should be. It’s simple to use, works well, and does not impair your system. Microsoft’s competitors will argue that it’s less secure and doesn’t have as many features, but they should be worried. Overall, Security Essentials is excellent and I highly recommend it. Good virus, malware and spyware protection. Fast and uses minimal resources. Not as many features as some other packages. 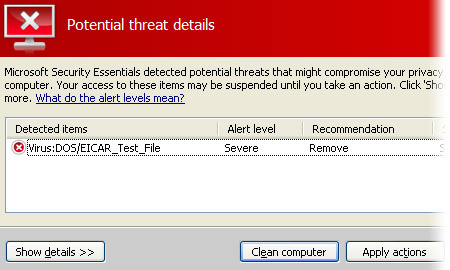 Virus writers might be more tempted to target Security Essentials because it’s from Microsoft.